It's all about the girls with this beautiful pink floral theme basket. Send your best to new baby AND proud mom with this adorable Pretty in Pink gift set. 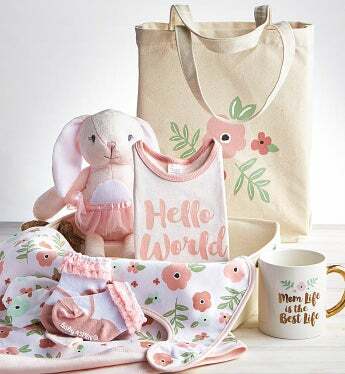 The versatile canvas tote is packed with cute baby necessities like a blanket, bib, bodysuit, plush ballerina bunny, socks, and mittens as well as a fun "Mom Life Is The Best Life" mug and tote bag for mom. A great way to celebrate mom and daughter! Gift Measures 15" X 10" 10"